Back to work after a Christmas break is a tough one. You go from the festive spirit, lots of food, wine, making merry with friends and family to the serious business of earning a crust. This morning I woke up and still felt festive, if a bit tired after a full week of merry-making and the return to France. By the end of the day I felt it was all over. The deccies are still up, and will stay up until Twelfth Night so as not to incur the wrath of the Christmas Spirits and scupper the year, but my heart's no longer in it. I can no longer put off tidying my lovely pressies away. I'll have to empty my suitcase and generally tidy up the rolls of wrapping paper and boxes of Christmas cards. Après-ski is fun; après-Christmas is not. Christmas is like a bubble of unreality. You suspend real life while you see friends and family, eat too much at every meal, quaff too much alcohol, indulge in cakes and snacks in a concentrated few days. I think it's the coming back down to earth that makes the hardest bump. I was in the UK last week. On one evening, I met up with a couple of guys from school who I hadn't seen since they left at 16. We had a fantastic time reminiscing, catching up on who had done what, who had died (not so fun), who was where, etc. A real plunge back into the past, it was. A mega dose of nostalgia. Back in the present, it's the New Year and I don't even want to think about what's coming up. 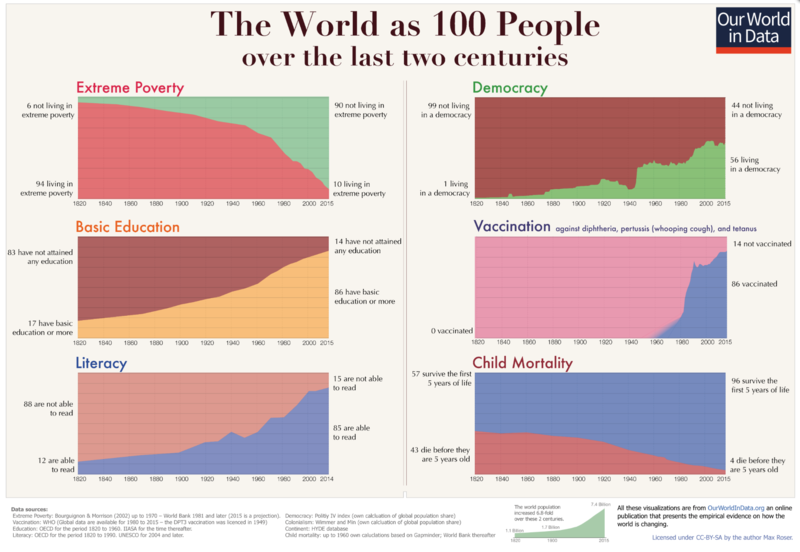 Instead of plunging into gloom and doom, today I cheered myself up by noting the huge progress in human civilisation since 1820 as seen in the graphs of The World as 100 People. Let's just hope the good things carry on getting better and the bad things continue going down. Ah so you're back from the UK. It's the 6th today so are your decorations definitely down now? I did incur the wrath of Christmas spirits and took mine down on Monday/Tuesday - I can't even remember what day it was! The best bit of Christmas was having Rory back for a whole month. He returns to Exeter on Monday but it has been just lovely this holiday and he's been a real pal, lots of fun and loads of rubbish telly watching with him. I think my bump will happen on Monday afternoon - sob! Those graphs do make for positive thoughts - I will keep focused on that in the months ahead! I took my deccies down on Thursday evening so the cleaner could have a free run to clean up. :) Almost the 6th. I'm glad you had a lovely time, and how wonderful that Rory was there for the whole month.